Amerimix offers Masonry Cement Mortar Mix in Type N, S and M compressive strengths. Pre-blended for consistency, Amerimix mortars offer increased workability and yield compared to field mixed mortar. Our mortars are also formulated for extended mortar board life so less re tempering is required in hot or windy climates. Amerimix offers mortar mixes for special applications including high moisture environments or historic renovation. For projects in coastal and other humid climates, choose Amerimix Water Repellent Mortar for added protection against moisture intrusion. This mortar mix features a water repellent agent which is preblended to ensure it is perfectly proportioned every time. An integral water repellent in the mortar eliminates the need for admixtures and reduces efflorescence. 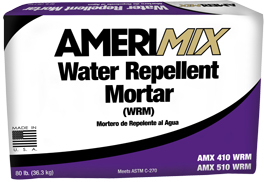 Amerimix Water Repellant Mortar is available in Type N, S or M compressive strengths. For historic repair and renovation projects, trust Amerimix Historic Pointing Mortar. 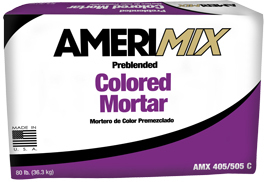 All Amerimix mortars are engineered for load or non-loading bearing construction. For convenience, our mortar mixes are available in small bags and also in bulk bags for those high-volume jobs. If colored mortar is a requirement, Amerimix can custom pigment any mortar to meet architectural specifications. To contact a sales representative in your area, please visit our sales rep finder page. To locate Amerimix products in your area or to schedule silo and bulk bag delivery, contact Amerimix customizer service at 1.888.313.0755. AMX 400 series mortars are manufactured using Portland cement, hydrated lime and dried mason sand. AMX 400 series mortars are available in Type N, S or M and can be custom pigmented to meet architectural specifications. AMX 500 series preblended mortars contain masonry cement (Portland cement when applicable), proprietary admixtures and dried mason sand. AMX 500 series mortars are available in Type N, S and M and can be custom pigmented to meet architectural specifications. AMX 410/510 WRM Water Repellent Mortar eliminates the need to stock water repellent admixtures. It also eliminates the possibility of under-dosing or over-dosing the mortar with admixtures. Regardless of batch size, the repellent agent is correctly proportioned in every batch. 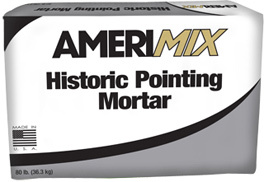 AMX 420 Historic Pointing Mortar is a factory blended mixture of graded sands, hydrated lime and Portland cement formulated to repair and restore masonry structures without degrading the integrity of the historical structure. AMX 405 C and 505 C are factory blends of portland cement, hydrated lime, dried sand and color pigment formulation engineered to provide long water retention, exceptional workability and superior bond strength over masonry substrates. Amerimix offers 20 standard colors or can customize color match to your project requirements. Custom formulated to match, compliment or contrast brick, block or stone. 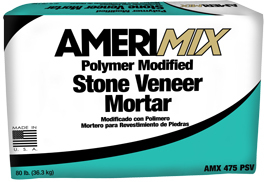 Amerimix AMX 475 PSV Polymer Modified Stone Veneer Mortar is a high performance, polymer modified mortar designed with superior bond strength and ability to grout artificial stone on horizontal and vertical surfaces to concrete or masonry substrates. 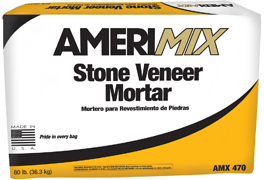 Amerimix AMX 470 Stone Veneer Mortar is a high performance mortar designed to set and grout artificial stone on horizontal or vertical concrete or concrete masonry substrates. © Huff & Sons Construction, Inc.